The Advanced Mountaineering Day School (AMDS) is an introductory follow up climbing course that teaches additional (and more technical) skills essential for climbing Mt. Rainier and other alpine climbs. The primary focus is preparing climbers for harder glacier/alpine routes like the Kautz Glacier and Liberty Ridge as a participant on a guided climb. It is not sufficient training to allow you to climb on your own. The AMDS is a full day of learning and practicing climbing techniques which include ascending and descending steeper glacier snow and ice of up to 40-50 degrees in angle; following on multi-pitch belayed climbs; anchor construction; anchor management; rappelling, lowering down steep pitches in descent and use of technical ice tools as conditions permit. The school normally takes place on the lower Nisqually Glacier, an hour and a half hike from Paradise. In early season, when the glacier ice is still buried in snow, the school may be held closer to Paradise on appropriate slopes. We'll spend all day becoming familiar with advanced climbing skills. It is highly recommended that participants combine this day of training with the Mountaineering Day School (MDS) as the AMDS builds on skills taught during the MDS. The Advanced Mountaineering Day School takes students beyond the basic glacier skills set to travel on steeper glacier snow and ice. This course was specifically designed with the Kautz Glacier, Fuhrer Finger and Liberty Ridge routes in mind, but it is a good review for those planning to climb on their own or who feel the need for additional advanced training. 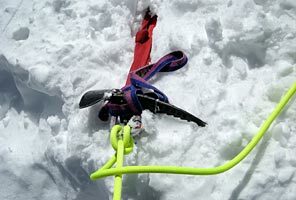 The AMDS is a hands on course which allows a substantial amount of time to practice skills before getting on a climb of Rainier or other glaciated peaks. It also serves as an excellent review for those with past climbing experience who have not worked on their skills lately. Private schools available on request, minimum 4 participants.